I love to travel AND I am lucky enough to live in arguably the most beautiful part of my lovely country. Here you’ll find out about the wonders of Southern New Zealand. Back to Basics: Who’s Who on the Revenant? Here’s a quick overview, with all you need to know about The Revenant Ultra Adventure Run… When, What, Who, Where and Links to all the websites. WHAT: The inaugural running of the Revenant, the first-ever race of its kind in New Zealand. Leroy de Beer is an ex-military man with a passion for fitness and running. Originally from Pretoria, he owns PT Central — a gym in Alexandra — as well as being a sought-after long-distance-running coach. Now, with his new business Off The Grid Events NZ first race, Leroy’s causing waves of excitement in the running community with the Revenant’s extreme challenge. Scott Worthington’s a businessman and longtime runner, Ironman and Adventurer. Originally from Auckland, Scott and his family now love to call Alexandra their home. He’s passionate about the outdoors and loves the synergy between The Revenant race and Welcome Rock Trails. You can read more of Scott’s story at Behind the Revenant. Want to see a little bit more of The Revenant and its directors? Leroy and Scott give a few clues in their Race Hints video series here on Facebook. Many of the names of the hardy souls who’ve been selected for entry into this inaugural Adventure Run are currently a secret, but they’re a diverse bunch of men and women from New Zealand, Australia, South Africa and the USA. I’ve heard hints that one’s a professional cyclist. Others are runners or come from the Ironman fraternity. Some are from the military, others are passionate Adventure racers. I’m willing to bet there’s at least one who’s raced in the Godzone before. All will be revealed at the race briefing on January 18th. SPECIAL UPDATE: Meet the competitors at the Garston Hotel from 4pm Thursday, 17th January. Don’t miss this unique opportunity to meet these legends of adventure. Welcome Rock Trails is a unique and special part of the Southland High Country. Within its boundaries, you’ll find almost every sort of terrain available in this area — river, mountain, bush, tussock, valley and a special history that’s been loving preserved and celebrated in the creation of the Welcome Rock Cycling Trail. The Revenant fits well into the ethos of Welcome Rock. Both have a sense of the special history in the hills above Garston, a desire for minimal impact on the environment and a passion to create an experience that lasts well beyond the moment. You can read more about Welcome Rock here in Trails and Tributes. The Revenant Race Directors are thrilled to welcome Giltrap VW Commercial as the sponsor for their inaugural Ultra Adventure Run. VW is providing vehicles for the shuttle service up to the race start, and as you can see from the Revenant Facebook page, Scott and Leroy have been using one of their super smooth and reliable Amarok V6 utes to get around on their Revenant duties. I sat down with Scott Worthington of The Revenant Ultra Adventure Run to ask him about this exciting event happening here, above Garston, in January 2019. Where the likely outcome is failure how far will you go? You’ve obviously got a huge passion for this race. What led you to create it? I’m always looking for a challenge. Now there’s a race in the States called the Barkley Marathon and it’s something I’ve always looked at. It’s the ultimate running challenge and it’s a very quirky race; very difficult to get into. It’s cryptic — you don’t even know when it opens — so even the entry process is sort of reflective of the challenge. I’ve tried three times to get in and have never had a reply. So that’s really what created the spark. I thought; “We’ve got some pretty difficult and unique terrain in New Zealand so why not put something on here? So that’s really where it started. Why is it called The Revenant Ultra Adventure Run? I’ve always liked the word Revenant. A lot of people don’t know what revenant means but basically, it’s a spiritual thing — that’s one definition, someone’s spirit coming back from the dead. But it’s also defined as someone who goes away for a long period of time and reemerges. So it seemed that as we were creating a challenge where people would go off for a long period of time and there was a high probability they wouldn’t re-emerge (ie finish) anyone who did finish deserved a pretty good accolade. I can’t think of anything better than being called a revenant, and that’s how we came up with the name. What’s the race format and what will happen during the race? The Revenant is a lap-based race. The competitors will go four laps and each lap is basically the same distance. They will have 60 hours to complete those laps. Each lap has to be done in the reverse direction and they will not know what the starting direction will be until they’re at the start line. So once we tell them what the first lap direction is they have to alternate after that. Competitors also have to follow a set number of checkpoints which basically lead them around the course, but they get route choice in between. So they have to decide how to get from one checkpoint to the next. At each checkpoint, there might be challenges or information they’ve got to digest and every time they come through they get the opportunity to give up or continue. Later in the race, there are time parameters which they have to meet. If someone’s got no hope of completing it in the time left we’ll pull them out. The Revenant is an exciting innovation for Welcome Rock Trails. What makes this the perfect place to run an ultra-endurance event like yours? Is THIS part of the route for The Revenant Ultra Adventure Run? When I first started thinking about this race I wanted to do it in a uniquely Kiwi way. The Barkley was just the beginning. The terrain around here varies quite a bit but you’ve got to travel to get to different types like Fiordland bush, or high-country tussock. But a few years ago I did a running race that Tom put on and that’s where I saw the property. Welcome Rock is the perfect place for The Revenant Ultra Adventure Run because within a loop of roughly 50km you can travel across just about every type of terrain that we have in the area; rocks, water, bush, tussock and more. That’s pretty unique. Who’s running this inaugural race and what was your selection process? The type of person that we thought would enter was going to reflect what we called the race. It’s called an Ultra Adventure Run for a reason, it’s not just 3 words strung together. So, basically, Ultra — you’re looking for people who can do long distance; Adventure — that’s the map and compass type navigation and that’s adventure racing; And then the Run. If you’re going to finish this race in the time allowable then you’ll have to be able to run where the terrain allows. So the people coming are a good cross-section. We’ve got adventure racers who are learning how to run. We’ve got runners who are learning how to navigate. They’re all on the fringe in terms of long distance. Then we have the military aspect. Leroy, my partner who’s putting the event on, is ex-military and it was his idea to do that. So we’ve got Navy Seals from the United States and some of our Elite Forces from New Zealand. And that’s great because a lot of the fringe endurance athletes like to measure themselves and our people in the military are generally pretty good. So it’s a good measure. Our goal is to create a bespoke, unique challenge that will endure. What are your goals for this first event, and what is your vision for its future? For this first event, our focus is really putting on the best event we possibly can. We’ve got a great sponsor in VW Commercial, but we haven’t overly worried about how many people turn up and therefore the way we’ve publicized it has been fairly organic. We just want to make sure that the event we put on is the best it can possibly be. And we think after that the rest will follow. We want to establish this worldwide as a true adventure challenge. How can people get involved in the build-up? The race briefing and the start on January 18th will be the only times you’ll see all the competitors together. VW Commercial has given us vehicles to transport people up to the start after the competitors have been taken up there. That’ll be a shuttle service, and that’s when we really encourage people to come — to the briefing at the Garston Hotel and the start on Welcome Rock Trails. And how can we follow the race while it’s on? We’ve opted not to go for live tracking because that’s notoriously unreliable, but also because of the nature of the event. The Revenant is really for the competitor, not for the supporter. It’s a bit of a back to basics sort of race. However, we will have a live Facebook feed. There’ll be volunteers out on the course to keep an eye on things and they’ll be able to radio in snippets of information as they see the competitors go by. So that’ll be on the live feed, but you won’t be tracking individual people. Personally, I think that this inaugural Revenant Ultra Adventure Run is an exciting new event for Welcome Rock Trails and for the village of Garston. You can be sure that I’ll be there at the start line to cheer the competitors on. Q: What do Beekeeping, Scotland and a tall lanky Kiwi have in common? A: Garston Hunny Shop owner Benedicte Sparks loves them all. But after 12 years of getting dressed up to go out, only to have to cover up with a coat or risk getting soaked Bene decided to find warmer pastures. It was a long road that eventually brought this petite, dynamic Frenchwoman to the other two loves of her life. Bene Sparks is always happy to serve up some of her delicious honey in the Garston Hunny Shop. Dijon… Paris… France. To my ears exotic, exciting, magical faraway places that I dream of visiting. To Bene, they were just home. And like any teenager, she didn’t find them the least bit exciting. School was particularly boring. She left at 16, served in a bookshop for a while, and then moved to the bright lights of Paris to work for a dictionary publisher. Ah, Paris! City of dreams and romance. The Louvre… Eiffel Tower… shopping… cafes on the left bank and not a honey bee in sight. Bene wasn’t really into honey at that point, but she quickly discovered that she wasn’t into publishing either. A chance meeting with a Scottish lad who spoke a smattering of French gave Bene a new direction. “I’d love to learn English,” she told him. Six months later — when she’d almost forgotten her chance remark — a language school brochure landed in her mailbox. So Bene — still a teenager — packed her bags again and moved to Scotland to study English. Her sister drove her there, dropped her on the doorstep of her new home, waved goodbye — and left! Well, there was no turning back, so Bene picked up those bags and went in to meet her new flatmates — a Swiss who was into punk and a boy from Nepal who turned out to be a prince. In hindsight, the safety pins and punk outfit should have set off alarm bells in Bene’s mind but she was so relieved to hear someone speaking French that she went to the concert anyway. “I felt very unsafe in my little French skirt with all the skinheads and punk music,” Bene recalls. So there she was — a teenager in a foreign land — and no wonder she was scared. Life is infinitely more difficult when you don’t speak the language. She had just two choices: run home or learn English FAST! Slinking back with her tail between her legs didn’t seem like a great option so Bene knuckled down at school. Full immersion is the way to go, of course, and after a few months, Bene could speak well enough to land a job. Scotland is a beautiful country and Bene quickly grew to love everything except the climate. But Scotland is renowned for its rain, and in the end, Bene had had enough of that, so she and a friend decided to see the world. So many countries; too many experiences to recount. But after nearly a year of travelling together Bene and her friend were still talking to each other — a minor miracle — when they reached Australia. By that time they definitely needed a break from travelling and each other. So they settled in Sydney and went their separate ways. If they’d landed in Melbourne then Bene might never have come to New Zealand. She’s since been to Melbourne and loves its cosmopolitan vibe. But living in squalid digs in Sydney and working for peanuts wasn’t much fun and Australia’s such a vast country that it’s hard to travel around if you have no money. So Bene saved up enough for an airfare and moved on. The logical next step, of course, was New Zealand. First, a stint in Auckland followed by a kiwifruit season in Te Puke — Bene was slowly working her way south. Eventually, she discovered Queenstown, as most traveller-workers do in the end. Like many a Scot before her, Bene had at last found a country with the beauty and friendliness of Scotland but without the chilly summers and depressing damp. Then she fell in love with Tony Sparks, and that sealed the deal. The opportunity to move even further south came when Tony and Bene bought the Garston Hotel. The tall Kiwi and the tiny Frenchwoman brought new energy to the Garston Hotel, and business boomed. But running a country pub is exhausting, and you can only do it for so long. So eventually, they sold the pub and settled down to renovate the old stone building next door and to begin their next ventures — The Garston Stables and the Hunny Shop — just across the road. Bene’s beehives — supplying Garston with delicious local honey. Bene’s right into bees now, but she didn’t expect to fall quite so crazily in love with them when she joined Matt Menlove’s local beekeeping course. “I was interested and I wanted to help save the bees,” she says. There’s so much to learn, too. Matt’s lessons were only the tip of the iceberg when it comes to knowing about bees. Bene’s constantly finding new information and new challenges. Every year is different because no two seasons are the same. Spring could be warm and dry one year and cold and wet the next. Even more confusing for bees and the plants they feed on, this year Spring started early and has been alternating between the two states all season. Consequently, the bees got ready to swarm around the end of October and Bene had to keep a close eye on them so that she could separate out the new queen and her followers and move them to a new hive before they actually swarmed. Bees need good food and Bene has made sure that there’s plenty around for her particular pets. She’s in the never-ending process of creating an extensive garden around the stone cottage, filled with bee-friendly plants. Honey bees need both pollen and nectar from the flowers to feed the hive, but they also inadvertently transfer the dusty pollen from flower to flower as they forage, and so ensure that the flowers are fertilized. Of course, that leads to fruit, seed production and eventually more flowers. It’s an elegant cycle. Bees and flowers. You can’t beat nature’s elegant cycle. If you add many bees and lots of flowers together you get an abundant supply of honey, so why not have a honey shop? Thus began the Hunny Shop, Bene’s Garston tribute to all things honey. It’s fun to go into the bright orange-and-yellow shop. There’s honey to taste and buy, as well as pills, potions, lotions and Bene’s very own honey-based cosmetics line “Abelha.” The walls are covered with bee information, too, so you can learn while you browse. You can even have an escorted “bee experience” if you like, and visit the beehives to see first-hand where your honey came from. After all that, who wouldn’t want to buy a delicious honey-filled pot? Finally, when you get home and regretfully lap up the last drop of your Garston Honey, you can buy more online at the Hunny Shop’ Shopify store. Just a few of the delicious honey products on display at the Garston Hunny Shop. It’s great to make a contribution to the world around you, and most of us have our own unique way of making things a little better. Bene’s style mixes French flair with downright hard work. She’s doing her bit to save the bees — and bringing more visitors to the vibrant little business hub of Garston. Next time you’re dashing to Queenstown, or buzzing South, stop into Garston and relax with a coffee, food, gifts and gorgeous honey-to-go. Many small businesses have a special story to tell. They are built on passion, commitment and a long-held dream. Each has a flavour, history and ethos that is all their own. Some are steeped in history, others are brand-new and excitingly different. Altitude Brewing, who last year took all of our green hops to flavour the delicious “Me and Jimmy McNamee” beer, is one such business with a story to tell. So what do a Queenstown local lad and an English former-advertising- executive have in common? Well, they both love beer, of course! But they also love adventure, the great outdoors, and the thrills and spills of owning their own business. Combine them all and you get a great little brewery called Altitude Brewing. When Eliott Menzies left Queenstown at the tender age of 17 to seek adventure in far-flung lands, he knew no more about beer than the average “under-the-legal-age-limit” teenage boy. But after a traditional Kiwi 6-month-stint in London, Eliott — now 18 and legally allowed to sample a brew — decided he’d had enough of cities and travelled north to Scotland. Looking for adventure (and perhaps hearkening back to his Queenstown mountain upbringing) he headed for the Highlands, where he landed a job at a mountain pub. And that’s where Eliott met BEER. Not your normal, big brewery, continuous brew type beer, but craft beer — ales, lagers, hops; beer to fall in love with. And that’s just what Eliott did. He fell in love with the whole process of beer from the brewing to the drinking, and everything else in between. It wasn’t long, in fact, before Eliott decided he wanted to know more than just how to drink beer, and so began the journey which ultimately led to Altitude Brewing. Fortunately, half an hour down the Scottish road was a small brewery. Eliott simply invited himself in one day and began to help out. Of course, it wasn’t a paid position; he was strictly a volunteer, but it was just what he needed. A free introduction to the brewing world. Eliott Menzies, creating a brew. Back in New Zealand, Eliott decided to spend 5 years in Wellington, studying architecture at Victoria University. Although he never did become an architect, it certainly wasn’t wasted time. Aside from his formal studies, Eliott continued his beer education by becoming a dedicated home brewer. Student flats always have a convenient cupboard — ideal for a homebrew setup — somewhere in the house. He didn’t follow other people’s ideas. In fact, it wasn’t long before Eliott branched out and began experimenting with his own unique flavour combinations. And after a while, those recipes became the basis for the various lagers and ales that Altitude Brewing crafts today. Eddie Gapper, checking out the perfect brew. Eddie Gapper came to Altitude Brewing via an entirely different route. Growing up in England, Eddie already knew what life was like in the Northern Hemisphere. His journey to beer heaven began with a job at an advertising agency. But while that was a lucrative path to follow, it wasn’t exactly living the dream. At least not the dream in Eddie’s head. So he and his wife followed their love of adventure and the great outdoors and headed off on their own O.E. Travelling in the opposite direction to Eliott’s northern adventures, Eddie escaped south, via Canada and eventually landed in Queenstown. At first, Eddie’s idea was to start a business in the adventure industry. 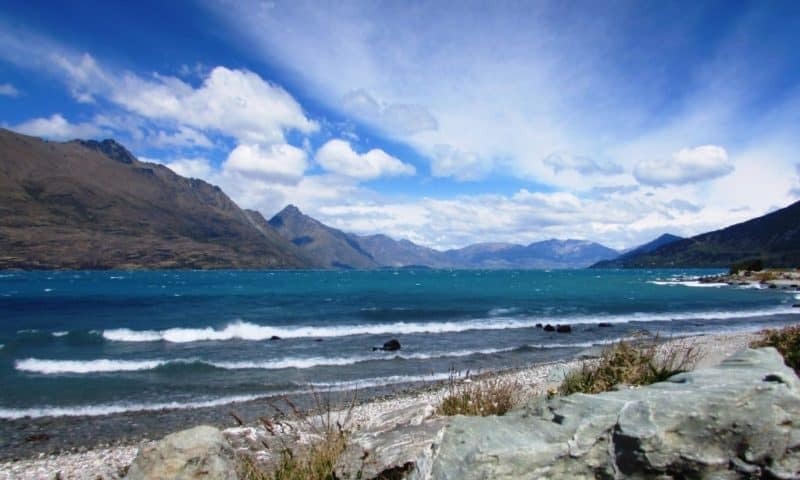 Queenstown is, after all, the Adventure Capital of New Zealand. But the market is fairly saturated with adventure activities. After a good look around, Eddie decided that it didn’t really need one more. What Queenstown did need was a business that was interested in the locals. A place tourists could enjoy, but which was ultimately focused on being a good citizen in its own backyard. So Eddie began looking for just such a business. It took a while. But one day Eddie had a beer with Eliott, and the Altitude Brewing team was born. It’s not often that a single person has all the skills and strengths necessary to run a business. And even if you are that rare breed, the time and energy it takes to do everything eventually results in burnout. Eliott loves brewing and beer — he’s not keen on managing and marketing. Eddie didn’t know much about brewing, but marketing and management — those are right up his alley. Together they made the perfect team to take Altitude Brewing to the next level. Eliot’s first plan for Altitude Brewing was as a contract brewer. Each beer was made to Eliott’s recipes but he contracted a Christchurch brewery to do the actual brewing. Altitude Brewing then sold the resultant beer in Queenstown pubs and selected other South Island venues. This was the path the company was following when Eddie joined the team. But Eliott and Eddie’s strength is their flexibility and willingness to investigate new ideas. Not long after Eddie became Managing Director, they realised that the contract brewing model wasn’t really the way to go. It was time they brewed on home turf. At first, this seemed like an impossible dream. We all know the price of land in Queenstown is horrendous — and availability is just as bad. But somehow, things came together and in 2017 they managed to secure a dream spot at Frankton Marina. Fast forward less than a year and, finally, Altitude Brewing has come home to Queenstown. on their recent team-building expedition in the South. We have tourist bars aplenty around here. Altitude Brewing, however, is one of those rare places that does focus on the locals. That’s not to say that visitors can’t find a good brew there; of course they can — and they’re very welcome. But first and foremost, Altitude Brewing is there for local people. I love their flagon initiative. Fun as it is to go out, sometimes you’d rather just have a quiet beer at home. Altitude Brewing makes that possible — and reduces litter and waste at the same time — by encouraging their take-out customers to bring their own flagon. Yes, you read that right. You can take along a container, fill it up with tap beer and head on home for your cold one. Brilliant. If you had to distil Eliott and Eddie’s Altitude Brewing attitude into just three words they’d be Adventure, Environment and Local. I love their energy and their enthusiasm for new ideas. They’re all about local connections and keeping the story going. The new Altitude Brewing premises at Frankton Marina. Connect with Altitude Brewing on Facebook. I’ve lived on a farm in Garston for 35+ years so that almost makes me a local. But my husband is truly Garston born and bred. His family were one of the first to settle in the valley when it was opened up to farmers in the 1860’s and the McNamees have been here ever since. So for our family, the ties to Garston run very deep, and we’d find it pretty difficult to leave. But what is it that makes this quiet country village so hard to beat? The “Around the Mountains” cycle trail, heading North to Garston. Let’s begin with Garston’s location. The village is set in the narrow Upper Mataura River Valley, and mountains range on either side, as far as the eye can see. Their beauty is different from the craggy splendour of Queenstown’s Remarkables range. Ours are “working” mountains; home to animals — farmed and wild — rare bugs, mountain plants and above all, the golden tussocks which colour the landscape. Above the village, hidden terraces slope in layers up to the foot of the mountains, and this is where our house can be found. When I step out of the back door for my daily walk there is not a soul to be seen. It’s just me, the birds and the sheep. What a way to begin — or end — a day. When Europeans first arrived they farmed the Upper Mataura Valley as one giant sheep station. But later on the area was divided into 200-acre sections and these were balloted out to small farmers and settlers. And that’s where the modern history in Garston begins. Our family came from the lean pickings of the gold claims in the Skippers Valley to try their luck at farming. Others made money killing rabbits — a lucrative enough trade in those days to enable them to save enough to buy into a farm. Some came from family farms further north or south. Life was pretty tough in those early days. The valley had very few trees back then and firewood was in short supply. The winters were brutal. There’s a famous tale of one long ago winter when the deep snow lasted for so long that the settlers had to use their carefully-hoarded fence posts for firewood just to survive. I still don’t know if he was joking or not. There’s gold in them thar hills. Or at least there used to be. Shortly after the settlers arrived gold was discovered in creeks and cracks all around, and life got busy as the gold miners flooded in. They came from all over the world to try their luck, set up camp for a while and livened up the area. Eventually, the gold became too difficult to find, and the miners drifted away to try their luck elsewhere. They left reminders of their stay, with a little cluster of Chinese miners’ graves in the cemetery, and the great water races which they dug high in the mountains to supply water for the great sluice guns in the Nokomai Valley just beyond Garston. The memorial picnic area north of the Garston Green. It’s easy to guess that Garston is proud of its history. One of the first things that stands out when you stop is the information booth, which was updated after much collaboration by local historians. And when you start to look around you’ll find caring memorials all over the Garston Green. North of the shops is the picnic area dedicated to John Newman, a former owner of the Garston Hotel, who planted so many of the trees between Athol and Arrowtown. Take a stroll towards the tree-covered hillside nearby and you’ll find a gorgeous little walk called Newman’s Way which takes you up over the knoll to Garston School. One of three entrances to Newman’s Way. Further down the Green, you’ll find tributes to the time when the trains ran in Garston because when the railway opened in 1878 it was a huge boon to the area. In those days before sealed roads, fast cars and huge articulated trucks, trains were the best and fastest way to travel the long distance between the “big smoke” of Invercargill in the South and Kingston — the gateway to Lake Wakatipu and Queenstown — in the North. Farmers transported stock in and out of the valley by rail right up until the early 1970s. Loading sheep onto the train at the Nokomai Siding, 1968. Photo courtesy of Pam and Peter Naylor. Even when trucks took over the job, the famous Kingston Flyer steam train ran through Garston as a tourist attraction until 1979, when floods damaged the railway tracks so badly that the whole line closed. Garston doesn’t forget, though. On the Green, you’ll find tracks, trucks and a display of antique jiggers. There, too, is a loving memorial to Russell Glendinning, a towering figure in local railway lore. Russell Glendinning was a hugely popular, expert train driver. He drove the Kingston Flyer on her last-ever trip through Garston. Peter Rabbit’s House has been a special secret in Garston for a long time now. It’s a bit of a mystery; who did put out that little clothesline and Peter Rabbit sign next to the rabbit hole? Whoever it was, I hope they know how their whimsy brought smiles, and that gradually other, secret “rabbit paraphernalia” appeared. Some of the original pieces in Peter’s village. Eventually, someone added a diary, and visitors started leaving Peter little notes. The House expanded in 2017 when the Garston School children decided that Peter needed company, and made a whole replica gold-mining era village. No one will tell you whereabouts Peter Rabbit’s Village is in Garston. To this day it’s still a delightful surprise to discover for yourself. Winding through the valley, the Mataura River is world renowned for its trout. People come from all over the globe to try their luck in the cool, clear waters during the fly-fishing season. Some eat their catch or mount it to sit proudly on a wall. But others are simply there for the love of the fish and the sport. Those intrepid fishermen are found in the tricky “catch and release” sections of the river. Some of the fish there are huge — and wily — having been caught and released more than once over the years. My favourite river memories are set in the 1990’s. Baking summer days, at the stony beach under the old railway bridge where all the local mums and kids gathered to cool off. The children floated down the river on giant old inner-tubes from their dads’ tractors, jumped off the rocks and ate enormous afternoon teas. The bravest of them hung over the rail of the towering bridge above. “Watch me! Watch me!” they’d yell and then leap down into the deepest pool below. Nowadays Garston is moving on and looking outwards. Travellers stream through on their way to the glories of Milford Sound or Queenstown and many of them stop at the Garston Green for a welcome break. Kids race to recover from their long journeys on the playground. Adults discover the delights of The Coffee Bomb, Craft Keepers and The Hunny Shop. But some opt for more than a quick stop. Fishermen, bikers, hikers and those who just want a slice of rural peace and quiet, can all find a bed at the Garston Hotel or at one of the lovely B&Bs dotted around the district. There’s no denying that living in the country has its challenges. Farmers tend to work the daylight hours: short in winter, long in summer. And of course, in the spring lambing and autumn harvest seasons, work can continue well after dark. And almost every trip requires a car: we’re simply too far from everywhere to walk. But despite that, Garston is a special place to be. Friendships run deep and beauty surrounds us every time we step out the door. I am lucky to call this little slice of New Zealand home. Eventually, I plan to have many more profiles of the enterprising people who live and work in Garston, Athol, Kingston and beyond. If you (or someone you know) would like to feature on Time of my Life I’d love to hear from you. Please contact me through the contact form below or message me through Time of my Life’s Facebook page. If you live further afield in the South and feel your story would be a good fit for Time of my Life, I’m happy to help. Contact me to arrange a time to connect.